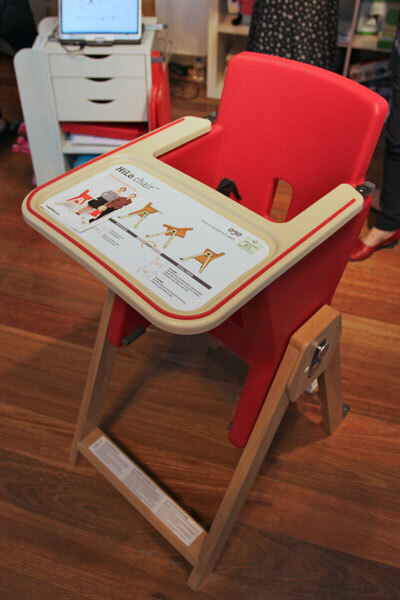 I’ve loved the Canadian-designed HiLo Highchair ever since first seeing it way back in 2008 so I’m excited to let you know this gorgeous and very functional piece of furniture has finally arrived in Australia. We last wrote about the HiLo in May 2008 so here’s a reminder of the features. The highchair comes in an array of appetising colours (strawberry, carrot, asparagus and portobello). My favourite feature is the moulded seat which is very secure looking and eliminates the need for a cushion and extra cleaning. The back legs have sturdy wheels for ease of mobility. They’re also timber-floor friendly and fully foldable for easy storage but I doubt you’d ever want to hide away such a stylish piece. The HiLo will keep your little one happily seated from six months of age (in its ‘Hi’ chair function) to six years (in its ‘Lo’ chair function) and modifying the chair to cater for these stages looks very easy. Nought2five has just begun stocking this beautiful highchair and is taking preorders now. It will set you back $429 but we promise it will be the star attraction of the dining room. I snapped a photo of one last week when it launched at The Baby Show and isn’t she lovely! If you’d like to compare of the features of this product with other highchairs on the market, please check out our fabulous Chooser.